I’m really excited about this month’s Styling the Seasons because both Charlotte and I have really challenged ourselves to do something that we don’t normally do and I, for one, found it really difficult! 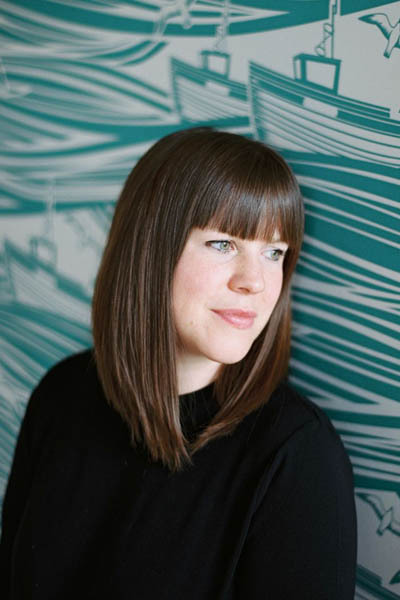 We wanted to make November special before all the glitz and festive fun of December so we are thrilled to be teaming up with Emily Quinton of Makelight this month. 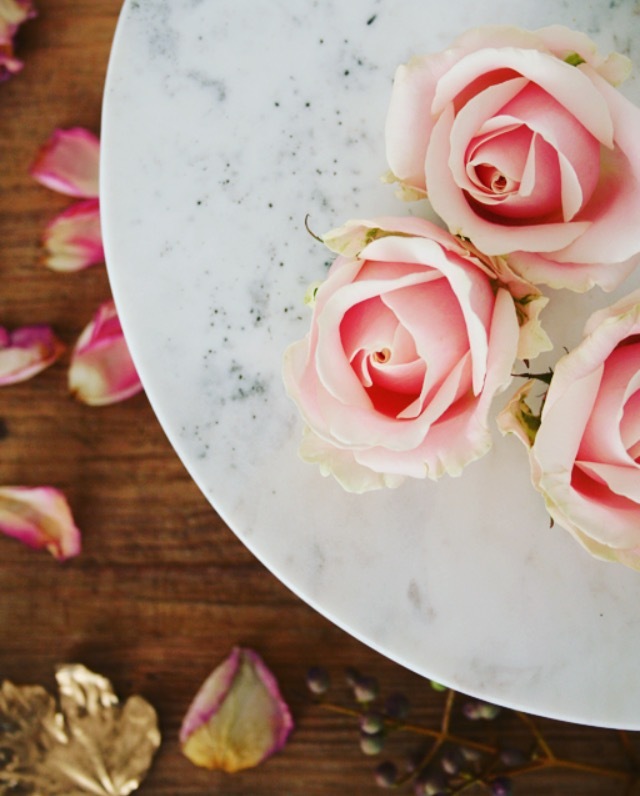 Emily runs photography workshops and courses and is the master of beautifully detailed flat lays so we decided to make this month all about seasonal flat lays. Our favourite November flat lay chosen by me, Charlotte, Emily and Ruth, who also works with Emily in the Makelight studio, will win a place on one of Emily’s workshops in her London studio or on one of her online courses. In principle the idea of doing a seasonal flat lay sounded wonderful until I realised that I don’t really know how to do them – oops! My issue is that I don’t really know how to do ‘whimsical’; you know, arranging flowers and pretty things for the sake of it. In contrast, I love styling interiors because I know they serve a purpose and they won’t be tidied up as soon as I have finished taking the photos. I tried five different things, then asked Charlotte for help and still couldn’t figure out what to do. So, I decided to get inspiration from a big, beautiful bunch of flowers and even though I only used three roses from the bunch they did help me come up with an idea. Marble cake stand from John Lewis’s Croft collection. Whenever I think about November, the first thing that comes to mind is falling leaves and walks crunching through them. However, I am not keen on Autumnal colours so I sprayed some leaves gold and scattered dead rose petals to represent dead leaves on the ground. 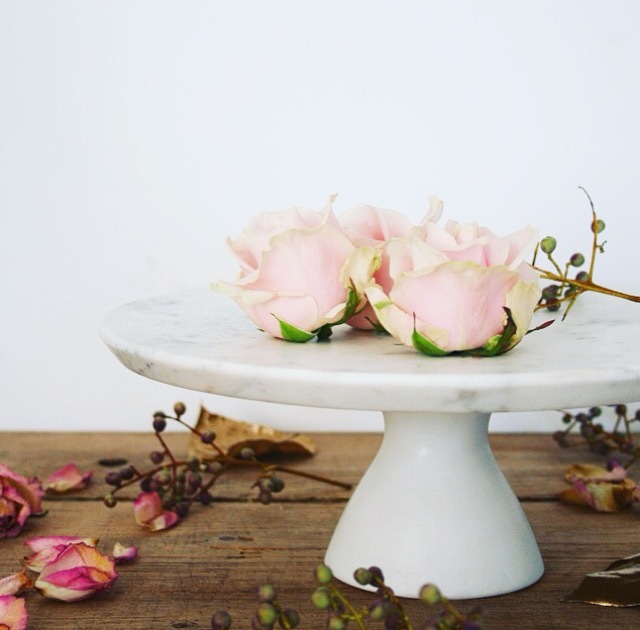 I then used a beautiful marble cake stand that my Aunty Lucy bought me for my birthday and placed three fresh pink roses to represent the last few remaining leaves on the trees, ready to fall. I hope you like my November flat lay, I have to say I really enjoyed doing it once I had an idea. Maybe I’ll try a few more! Do pop over to Emily’s blog, Ruth’s blog and Charlotte’s blog to see their posts. 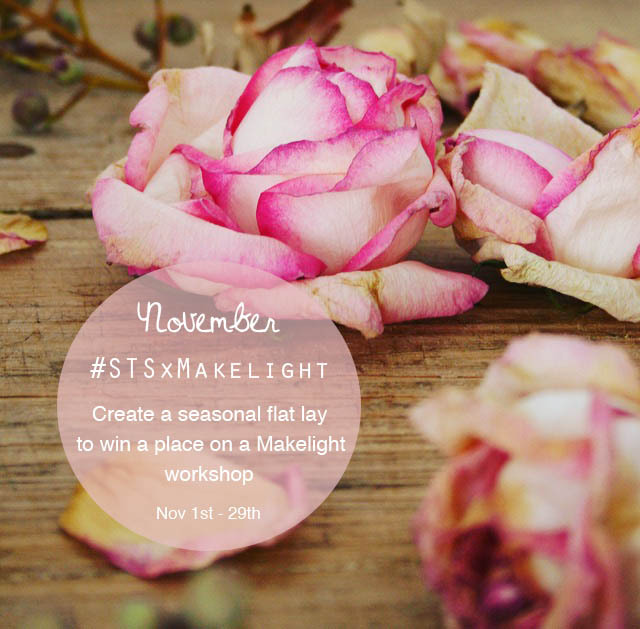 We would love to see your November styling either on your own blog or post a picture of it on Instagram using the hashtag #STSxMakelight so we can see it. Entries are open from today until November 29th. We will announce the winner on November 30th and they can choose which of Emily’s workshops or online courses they would like as their prize! SO exciting!